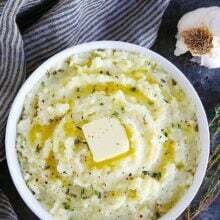 Mashed Cauliflower-a delicious low-carb side dish that is flavored with garlic, herbs, and butter. 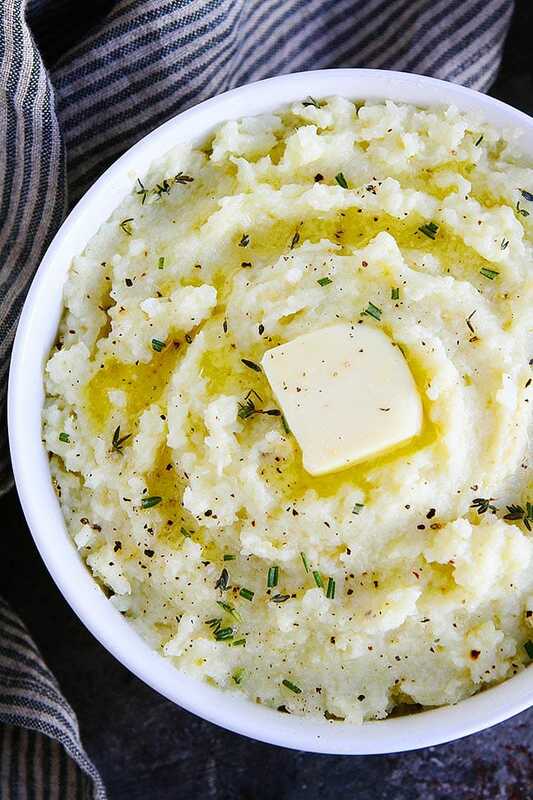 This easy cauliflower mash will remind you of mashed potatoes! Serve along side your holiday meal or any meal! Mashed cauliflower is not as starchy as potatoes, but you still get a creamy and delicious texture that is similar to mashed potatoes. This low-carb alternative to mashed potatoes is a great healthy side dish to serve at Thanksgiving, Christmas, Easter, or any meal! To make cauliflower mash, you need to steam the cauliflower. I like to use our Instant Pot to steam the cauliflower. It steams in no time and turns out perfect every time. 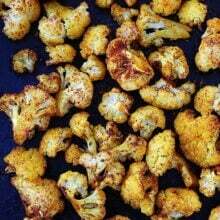 If you don’t have an Instant Pot, you can use a steam basket and steam the cauliflower on the stove for 6 to 8 minutes. It is really important that you steam the cauliflower instead of boiling it. 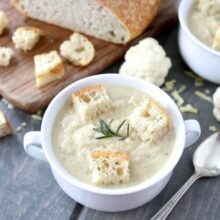 If you boil the cauliflower, the cauliflower will hold too much moisture and the mashed cauliflower will not have the same texture of mashed potatoes, it will be more of a puree. 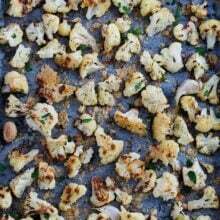 While the cauliflower is steaming, cook the garlic in a little olive oil. When the cauliflower is done steaming, pour it into a large bowl. Add the garlic, herbs, and butter. Mash the cauliflower with a handheld immersion blender or potato masher. I prefer the blender, it gets the cauliflower nice and creamy. Be careful to not over blend the cauliflower or you will end up with a puree instead of a cauliflower mash. Garlic-garlic is a MUST! The garlic adds lots of flavor to the mashed cauliflower. I sauté the garlic in a little olive oil before adding it to the steamed cauliflower. Herbs-I like to use a mixture of thyme and rosemary. You can also add in sage, parsley, or chives. Butter-Adding butter will make the mashed cauliflower creamy and will give it that mashed potato flavor. I like to use salted butter. You can use 2 to 3 tablespoons, depending on how buttery you want the cauliflower mash to be. If you want to go all out, you can brown the butter and add browned butter to the mashed cauliflower. The flavor is amazing! Cream Cheese or Sour Cream-I don’t add cream cheese or sour cream, but you certainly can! Cheese-If you want a cheesy cauliflower mash, you can add in shredded cheese. Parmesan, cheddar, or Gouda. Bacon-I don’t think anyone will complain if you add cooked chopped up bacon! It adds a ton of flavor to the mashed cauliflower. I love making this mashed cauliflower recipe for Thanksgiving, Christmas, and Easter. It is the perfect holiday side dish. 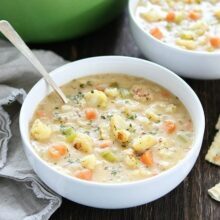 It can be made in advance and everyone will appreciate a healthier side dish…but they really won’t know it is a healthier option because it is SO good! They won’t believe they are eating cauliflower! And if you can’t wait for a holiday, make this mashed cauliflower to go with any meal. We make it all of the time because it is an easy side dish to any meal and I am always happy my boys are getting their veggies in. They never complain when mashed cauliflower is on the dinner menu. They love it and I think you will too! 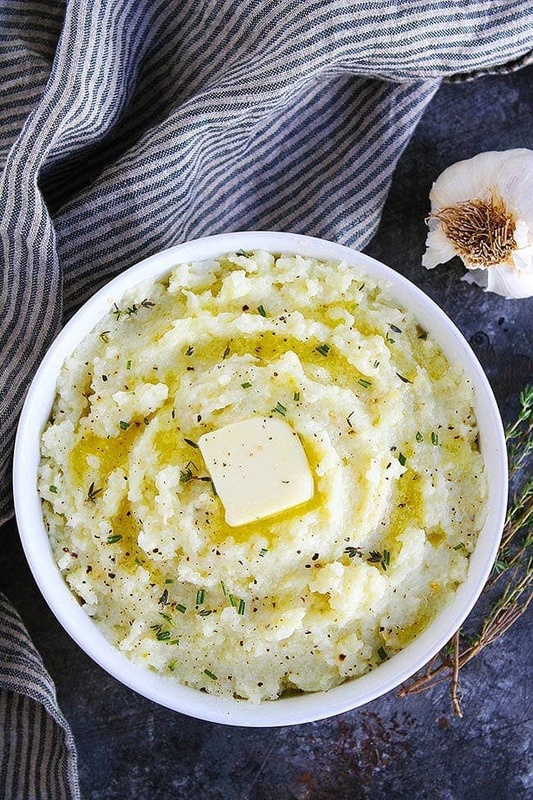 This easy cauliflower mash will remind you of mashed potatoes! Serve this easy side dish with any meal! To steam the cauliflower in the Instant Pot, place the steam basket inside the Instant Pot. If you don't have the steam basket, you can use the wire rack that the Instant Pot comes with. Pour 1 cup water in the Instant Pot. Place cauliflower in the basket or on top of wire rack. Put the Instant Pot lid on and turn until locked. Cook on high pressure for 4 minutes and then do a quick release. Carefully unlock the lid and place the cauliflower in a large bowl. Heat the olive oil in a small skillet over medium heat and add the minced garlic. Cook for 2 minutes. Pour the cooked garlic into the bowl with the steamed cauliflower. Add the butter and herbs. Use a hand held immersion blender to mash the cauliflower to desired consistency. Don't over mix or you will end up with a cauliflower puree. You can also use a potato masher. Season the mashed cauliflower with salt and pepper, to taste. Serve warm. If you don't have an Instant Pot, you can steam the cauliflower on the stove top using a steam basket. Steam for 6 to 8 minutes. There’s ALWAYS room for mashed cauliflower at my Thanksgiving table! How do you steam it without an Instant Pot? See the post, you can use a steam on the stove by putting a steam basket in a pot of boiling water.